Here's a shot that received some discussion recently on the AZBilliards.com forum that allows you to make an important strategic decision. I want to focus on the position play - namely, why it's better to go one rail instead of two. 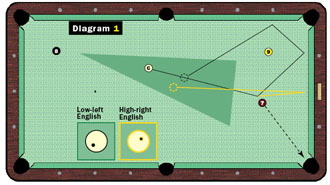 The shaded area in Diagram 1 indicates the approximate area in which you'd prefer to leave the cue ball and the line for the next cut shot on the 8. You can try to take the cue ball two rails on the 7-ball shot - hitting with low-left English - and end up near center table if you have good speed. Of course, if you underhit the shot, you could be hooked behind the 9 or forced into a long, awkward cut; if you overhit, you could end up on the foot rail. Instead, you can use a half-tip of high-right English and simply bring the cue ball off the end rail (yellow path). Here, the cue ball will travel along the path of the preferred line, instead of against it. If you underhit (or even overhit, to a point), you're still in decent shape. Always be aware of your preferred landing area, and try to deliver the cue ball on line with your next shot, instead of crossing away from or against the line. Some players will have trouble with the one-rail shot because they aren't comfortable with using inside English. Steve Mizerak once told me, "Sometimes if you take the slightly tougher shot, it will make the runout easier."